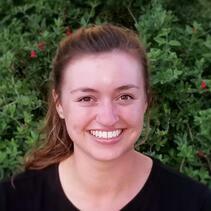 Kerstin Ozkan serves San Diego Zoo Global as a Research Associate in Recovery Ecology. She is part of the monitoring and research team that works with California least terns and Western snowy plovers at Naval Base Coronado. Kerstin’s current work focuses on monitoring the reproductive success and natural history of terns and plovers in their native habitat. As part of this effort, she is assisting with studies investigating the effects of climate change on the foraging habits of both species. Kerstin earned her bachelor’s degree in Wildlife, Fish, and Conservation Biology from the University of California, Davis. During this time she assisted with work focusing on how sensory cues associated with marine plastics influence animal behavior, specifically marine fish. Her scientific interests include investigating the behavioral responses of organisms to ecological and evolutionary traps.